“Hold the ball! Slow the play down!” The throaty instructions of both RI’s and SAJC’s water polo coaches could be heard throughout the ASC(I) swimming complex, as the A Division boys’ water polo 3rd-4th placing match got underway. The RI A Division boys’ team had lost narrowly to both HCI and ACJC in the previous rounds, two closely fought matches which denied them a chance of defending their title in the final. However, the team was fully prepared to end the season with a medal, and secure a top 3 finish for the school. 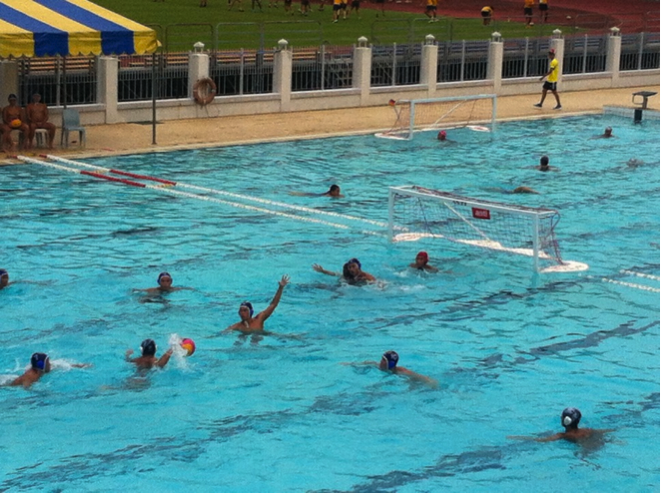 Both teams wasted no time in trying to assert an early advantage, with numerous attempts on goal and energetic bursts of swimming which drew appreciative applause from the handful of spectators present. Unfortunately for the Rafflesian supporters, SAJC managed to edge out the first two tightly-contested quarters of play, heading into the second break holding a slim 6-4 lead over RI. In the third quarter, RI played a slower passing game, moving the ball around the attacking half of the pool. They were rewarded for their work, with Kelvin Zhou beating the SAJC keeper with an effort from range to score the last goal of the quarter, narrowing the deficit to 8-7. With the game poised at 9-9, it was up to extra time to decide the match. Team captain Bryan Ong led by example, netting an accurate shot in the first half of extra time. With RI leading the match by a single point heading into the second half of extra time, it set up a nail-biting finish to the match, which saw SAJC pelting multiple shots toward goal every time they had the chance. However, RI held on to their narrow lead till the end of the match, claiming a very well-deserved win. 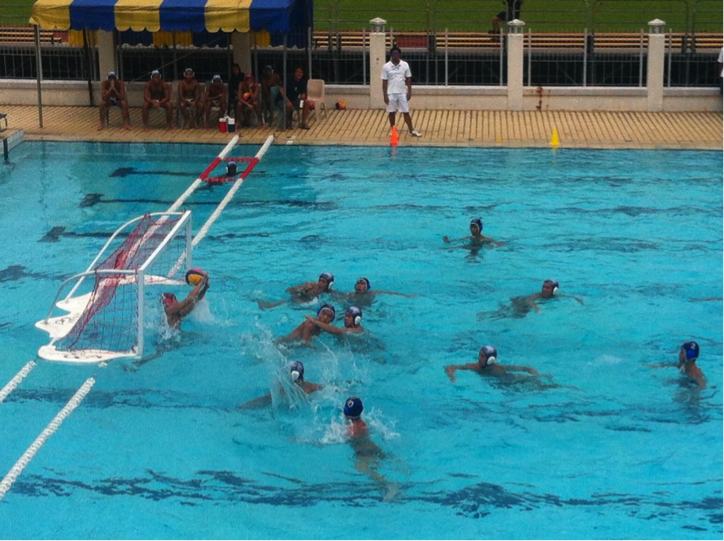 Raffles Press would like to congratulate the A Division Boys’ water polo team on their hard fought victory, clinching third place by a single point in what was an exhilarating match. We would also like to wish all other students the best of luck during this inter-schools season, and hope to be reporting on even more success in the months to come. On an unrelated note, aren’t Chin Wee and Jeremy from 14A01B?